Formulae: Date/Time format for cumulative hours beyond 24? 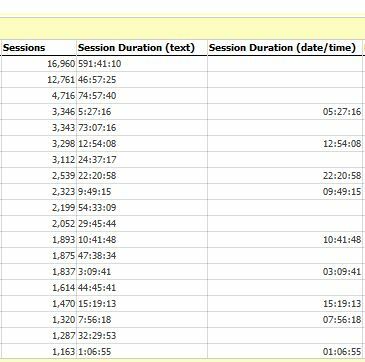 I'm pulling in Google Analytics data and attempting to create a formula to calculate average session duration (total session duration/sessions). The issue that I'm running into is when summing my "total session duration" date field. The HH:mm:ss format works up until the hour parameter hits 24 (as the setting for HH is a 24-hour clock). Is there a way to get around this 24-hour restriction? Should I be using a different format? The total time in this case would be an integer and not a date/time. To get minutes just divide that by 60 and for hours by 3600. Then divide that by [Sessions] and 60 for mins and 3600 for hours. Most likely your session durations would be in the seconds or minutes at most, not hours. *Just an addendum for the second formula, if you use left or right functions you have to make sure your time/session duration field is always defaulted to text. The numvalue() will change the individual subtext into a numerical format for your output. Once I get to seconds, is there a formula that can convert this back to the minutes:seconds format? Rather than 80 seconds showing 1.34 minutes (80/60), having it output 1:20 (1 minute plus the 20 seconds as a remainder)? This should give a text output format in terms of minutes:seconds, just create a new field where duration is the time duration in seconds of the previous formula.